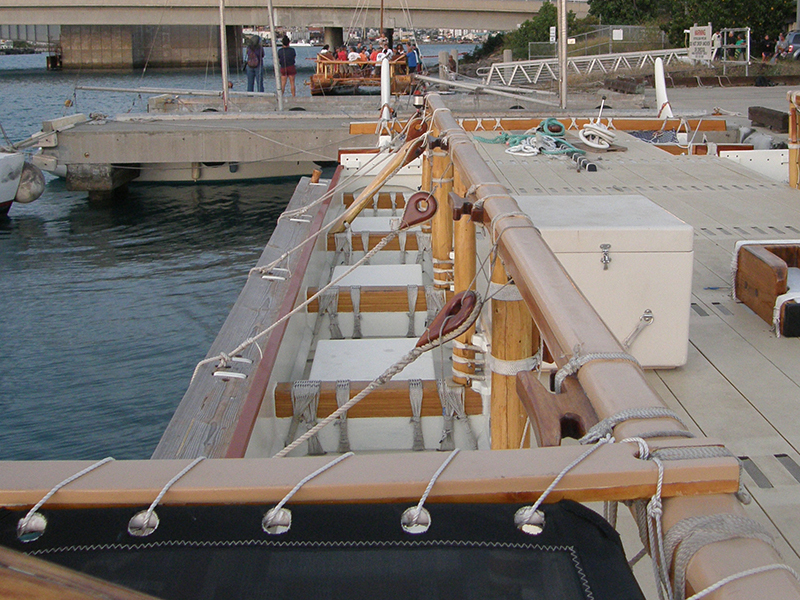 I knew there were hatches into the hull, not from Herb's diagram, but from working on Hokulea back in March 2013 when I attended Imi Naauao training for the World Wide Voyage. 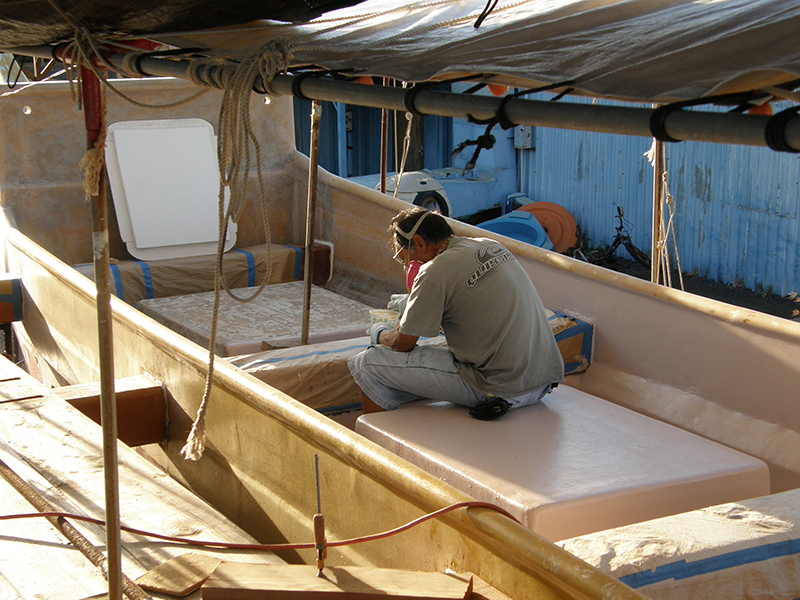 I had also seen them when the Kauai canoe Namahoe was under construction in 2012. 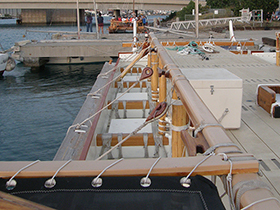 White hatches appear atop the hull in between the iako, Hokulea. Hatches atop the hull, Namahoe, under construction 2012. 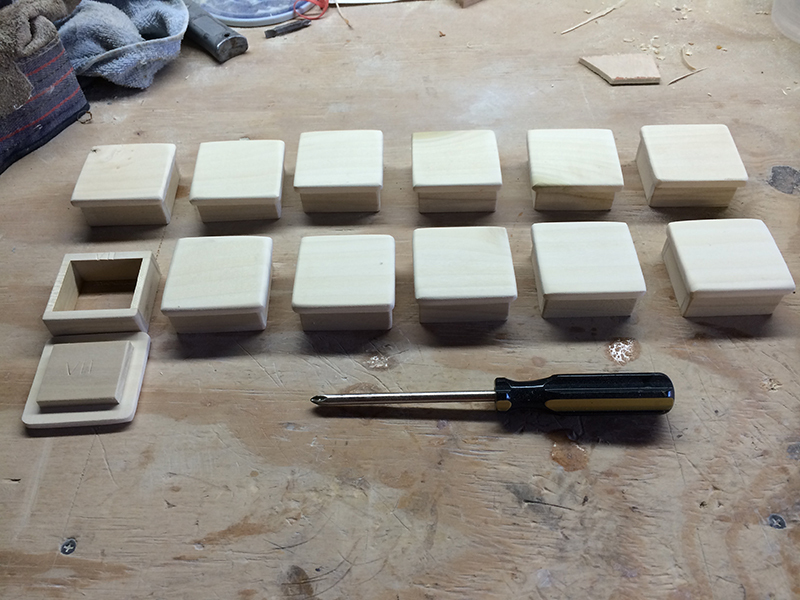 Making these puppies was tricky, because I didn't want to use any nails or screws, and it was difficult to clamp them without them parallelagramming into sandwiches. So in the end I used Contact Cement, which you put on the pieces and let dry a bit before fitting the pieces together EXACTLY. No margin of error here. That's what I did, but Contact cement is not as strong as wood glue or epoxy, so one or two of them fell apart while I was sanding them later, and had to be re-glued. 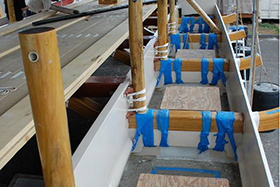 Now on the real canoes, the hatch covers come down over and around the tops of the hatches, to keep water out. That was not feasible, so I made ones that sat on top with an inset to keep them in place. Problem was, each hatch was a slightly different shape. So each hatch cover was custom-fit. 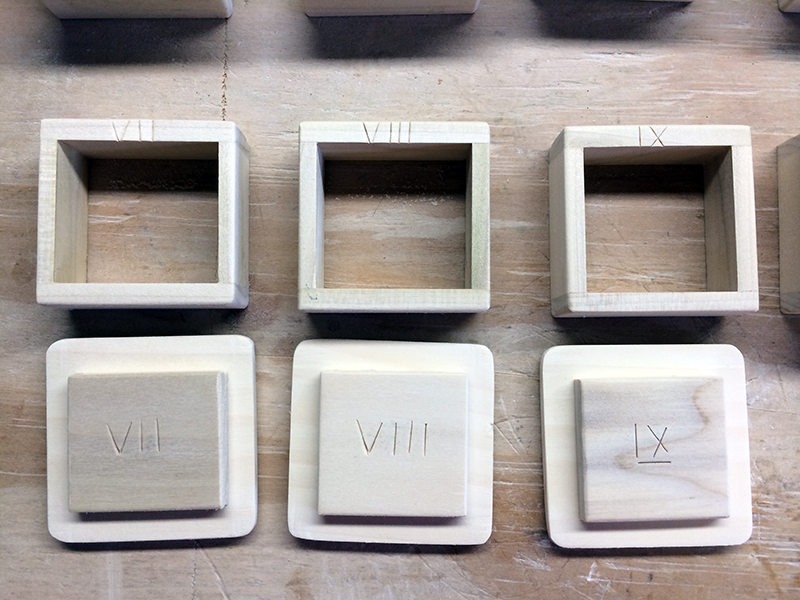 I then marked hatches and their matching covers with Roman numerals, to keep them straight. 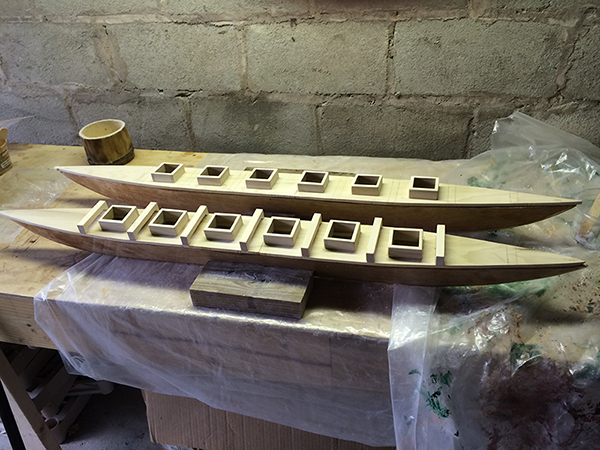 Twelve hatches and their covers—six for each hull. 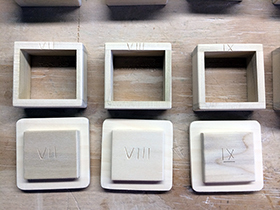 Hatches and their covers showing their numbered markings. Of course, then there was the matter of cutting the holes in the deck, carefully, such that each hatch would sit exactly over the hole. That I managed to do successfully, and was able to use epoxy to glue them down. That would add more strength to holding them together too. At some point I realized that there needed to be wae to lash the iako to. On the different voyaging canoes I had seen, these were all pretty much the same. 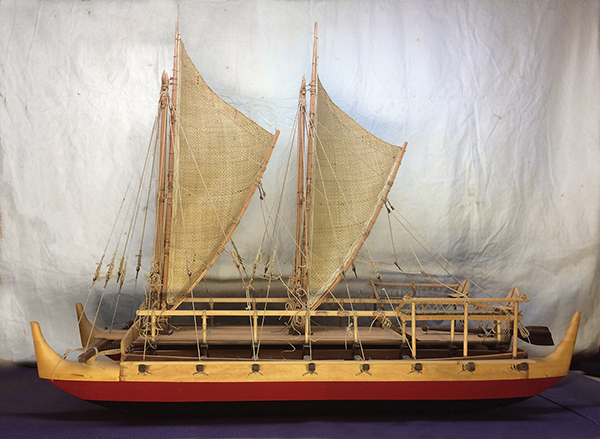 Iako lashed to wae on the Makalii. Iako lashed to wae in this PVS photo of Hokulea under construction. 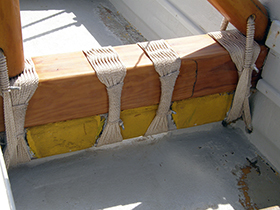 Painter's tape covers the lashings. 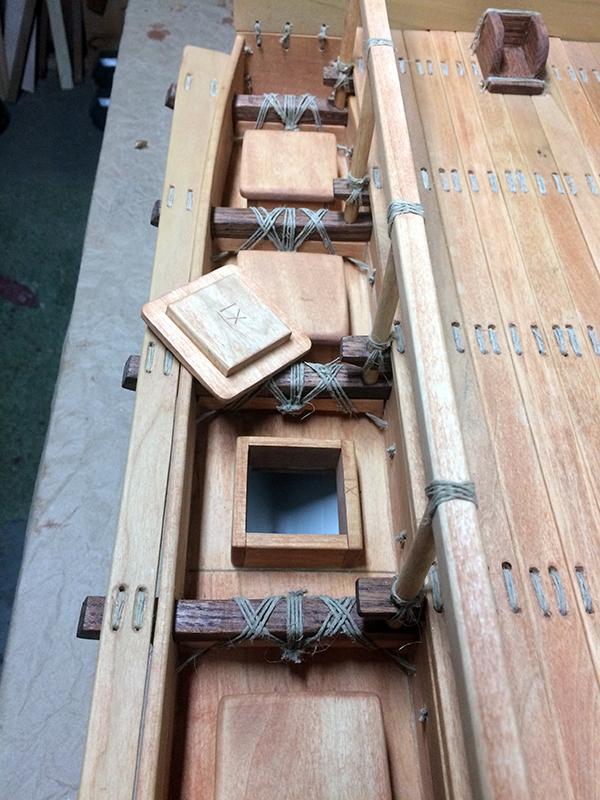 Here are my mostly finished decks with hatches and, on the nearer deck, the wae. I have yet to glue the wae to decks, and the decks to the hulls. You can see how the iako are lashed to the wae. This turned out to be particularly tricky, as I describe later. First there is the matter of making the iako.